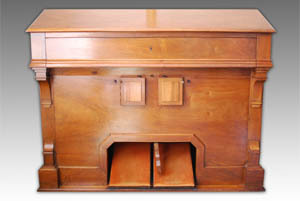 In April 2010 Scott Brothers Duo acquired this beautiful Mustel harmonium. The serial number is 1245-945 (This means that it is number 945 of the 1245 total instruments built to date by the Mustel workshop) and the wind chest is dated 20th April 1904. The instrument is listed in the Mustel factory records in Paris as being sold on 26th November 1904. 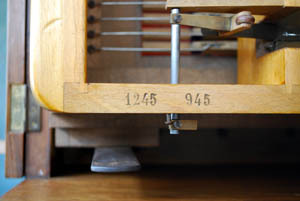 The harmonium has a walnut case and is tuned to a=440. It is in completely original condition and was restored in 2004 by Cambridge Reed Organs. The name Harmonium was patented in 1842 by Alexandre François Debain (1809-1877) of Paris. 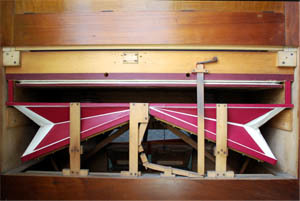 It was for a keyboard instrument which used pressurised air from bellows pumped by two foot pedals to produce sound from free-reeds (the same method of sound production found in the accordion and harmonica) creating an instrument which possessed the tonal qualities of a pipe organ and the expressive control of a string instrument. The instrument had multiple stops, like an organ, and a divided keyboard so that the player could choose different pitches and timbres in the treble and bass of a single keyboard. 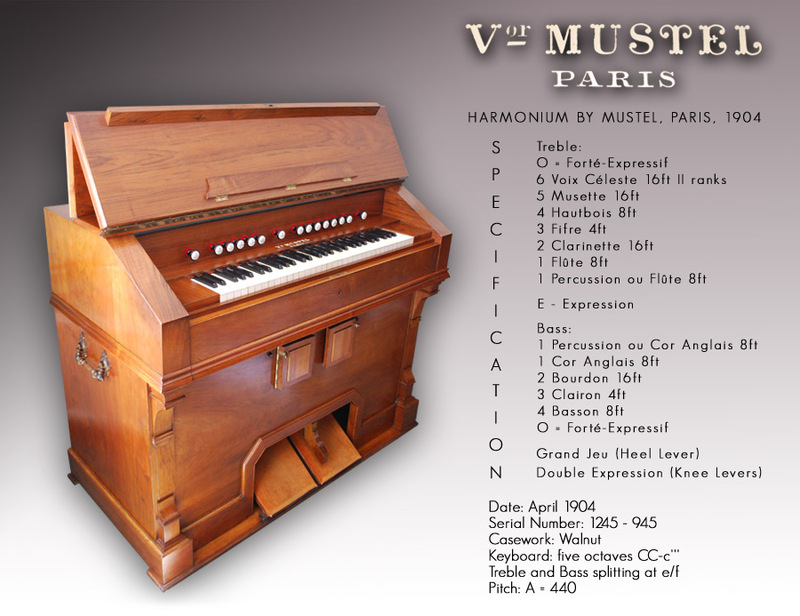 It was another French maker, Victor Mustel (1815-1890), who eventually emerged as the finest maker of harmoniums in the world. His relatively small output and exceptional craftsmanship won admiration from the greatest artists of the day. The popularity of the harmonium reached its peak around 1900 and its uses were widespread and varied. As an orchestral instrument it was used effectively by composers including Elgar, Strauss, Schoenberg, Webern, Mahler, Liszt and Tchaikowsky and more recently found its way on to tracks by The Beatles and many other popular groups. It was given a particularly important role in Rossini's 1863 Petite Messe Solennelle. Victor Mustels Grandson, Alphonse Mustel (1873-1937) and Sigfrid Karg-Elert (1877-1933) raised the profile of the harmonium as a solo instrument to new heights in the early part of the Twentieth Century with a large body of original works and concert schedules which included tours to many countries around the world. However, it was in chamber music that the harmonium found its greatest popularity especially in the brilliant combination of harmonium and piano which produced a vast amount of repertoire. This repertoire can be heard on Scott Brothers Duos acclaimed CD Duos for Harmonium & Piano which features original works and new virtuoso transcriptions performed on an 1880 Mustel Harmonium. The popularity of the harmonium declined in the 1920s as musical tastes changed, and the invention of the electronic organ in the mid-1930s delivered the final blow. Instruments were sold or scrapped and many were modernised with electric blowers. However, many were saved, or lay undiscovered for many years, and today are being brought back to life so that audiences can once again hear the glorious sound of this uniquely expressive instrument. For many years these instruments have lay undiscovered and today a few are being brought back to life. We hope that as many as possible of these instruments can be saved for future generations and sincerely believe that, like all musical instruments, they should not sit idle as museum pieces but should be played and heard so that so that audiences can once again enjoy their uniquely expressive sound.